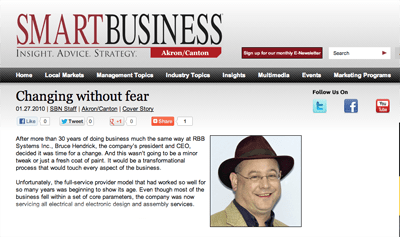 When SmartBusiness Cleveland Magazine honored RBB Systems with its 2010 Evolution of Manufacturing Award, it drew attention to the growing separation of RBB’s business model from the rest of the pack of reputable contract manufacturers. All the way back in 2008, RBB had announced that it had “left the field” of large batches permanently behind. Since these high volume (gravy) runs had always been the Holy Grail, SmartBusiness was intrigued. By 2010 it had become apparent that RBB was onto something significant. Not only had RBB’s pace of new customer acquisition accelerated, even several of its former competitors had become referral sources. There was certainly a story to be told here. As I’ve stated here before, out of fear most contract manufacturers tend to want it all. After many years of struggling in the no-man’s land between large and small batch contract manufacturing, once RBB made the decision to focus exclusively on small batches, whole new ways of thinking and doing business opened up. One of these was in the way it related to the other excellent contract manufacturers in the industry. Most large batch contract manufacturers (LBCM’s) do not compete with RBB or other small batch specialists for the same work. Sure, as part of the services they provide to their customers the LBCM occasionally produces small batches, but they only make sense financially when they lead to large batch work that repeats regularly over time. This freedom from direct competition must be present for any level of trusted collaboration to develop. Verify that large batches cannot be run through the small batch provider’s process. In RBB’s case, we do not have the capacity, equipment, or market interest in high volume work. Due to a completely different cost structure, RBB is not competitive on large batch work anyway. Have the LBCM’s salespeople witness this reality so that they can get creative to leverage both sets of capabilities. Small batches that are run through the LBCM’s process can be annoying and costly, even when there is open capacity. Profit margins suffer. Plus, high volume opportunities could be lost or compromised when the equipment is running small batches. So it is usually in the best interest of the LCBM to continually switchover from one long run to the next – and this is greatly enhanced when working with a partner who welcomes the small batch as a routine transaction, not a hassle. Due to the natural limitations of either strategy, there is business out there that neither party is winning on its own. Cooperation beats competition when each party has unique strengths that can be leveraged. Complex situations such as when one company purchases or inherits multiple large product lines often cause an “all or nothing” bidding event that no one player is ideally capable of handling profitably on its own. A strong partnership can be a powerful alternative where every player wins. Every manufacturing site runs into trouble from time to time, whether they become buried in short term work and run out of capacity or they get buried in water from a hurricane and they run out of the building! Having a pre-qualified manufacturing partner during these types of emergencies not only brings peace of mind to the customers, employees, and managers of both companies – it brings another powerful selling tool. End-users who rely on only one physical manufacturing site to meet their needs may be influenced by these built-in safety nets. As I said: obvious – but truly powerful. Whether you’re into small batches or large, please let me know if I can help you think through your partnering challenges. Also check out part one of the RBB YouTube Series focused on additional elements when forming successful partnerships. Bruce Hendrick has been a leader of major change in corporations and small business alike for the past 25 years; he's the owner of RBB Systems and Organizational Development Services, LLC; noted speaker, author, active church member and community volunteer.